Goodluck.... There is next to no support in this game, so i just hope, you did not spend money on it. Please state IGN and servernr so we can report this issue for you. And.............? we have dropped an egg on the pavement and await for the suns heat to cook it. we shall get back to you with the results of the tests we are doing for you so that you don\'t feel like we intentionally screwed you over. Easter event coming again. please wait for it. thats all you need to say. 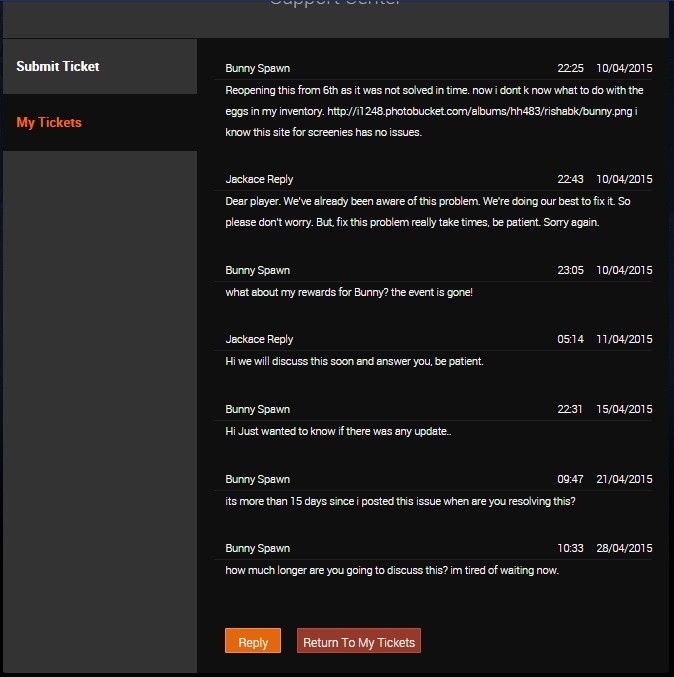 I\'ve reported your tickets as unanswered. Thank you Sir. IT is still unanswered. waiting for resolution. you do know there is a hide button that clears other players off the map, it really helps when collecting bunnies etc. 2019-4-22 16:58 GMT+8 , Processed in 0.068797 second(s), 52 queries .